Successfully Added Preorder Bluboo Mini Smartphone - Android 6.0, 4.5 Inch Display, Quad-Core CPU, 256GB External Memory, 1800mAh (Black) to your Shopping Cart. This Product is a Pre-Order Product that is expected to be shipped on the 17th of November. Do not order with other products. This is a Pre-Order product and as such the weight, dimensions and specifications of this product could be subject to change. We will update the listing when the product is received in stock. With its highly portable design, the Bluboo Mini is the perfect smartphone to carry along in your pocket at any time of the day. Featuring a small yet stunning 4.5 Inch Quad-HD display this Android phone offers the perfect platform on which to enjoy a magnificent visual experience. A high color gamut and wide angle view let you experience your media to its absolute most, allowing you to enjoy your games, movies, and Apps in stunning beauty. Running on an Android 6.0 operating system, the Bluboo Mini is a Chinese smartphone that comes with all the great and familiar features Android users are used too. A friendly interface is guaranteed to offer a magnificently smooth and fast user experience – allowing you to take the most out of your smartphone’s features without being interrupted. Coming with the latest features the smartphone industry has to offer, this Android 6.0 phone is sure to take your mobile user experience to the next level. 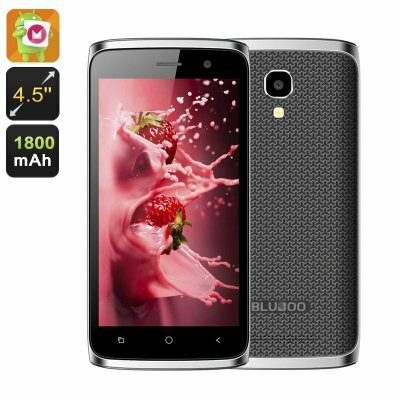 Featuring a powerful Quad-Core CPU that has been clocked at 1.5GHz the Bluboo Mini smartphone packs some decent power that is fully capable of handling everyday tasks without dropping a frame. Along with its Mali-400MP graphic card, this cell phone is able to take on the latest games and applications. Whether you like to watch a movie, play games online, or enjoy the latest mobile applications – this Android smartphone is guaranteed to offer you a magnificently smooth and detailed media experience. So head out to the play store and download the latest media as with the Bluboo Mini countless hours of fun and entertainment lay ahead. Coming with an expandable memory up to 256GB this Chinese smartphone is sure to offer enough space for you to store all your media, games, and pictures snapped with the phone’s intergraded 5MP camera. A large 1800mAh battery allows you to make phone calls and to enjoy all the features your phone has to offer for 5 hours continuously – enough to get through the most demanding of days without needing to worry about battery life. With its Dual-SIM card slots, the Bluboo Mini is the perfect smartphone that lets you conveniently separate work and private life – making this Android phone ideal for business and entertainment purposes alike. The Bluboo Mini comes with a 12 months warranty, brought to you by the leader in Android Smartphones as well as wholesale electronic gadgets..
Arabic: - الروبوت الذكي 6 - Chinese Simplified: - 6 的 android 智能手机 - Czech: - Smartphone se systémem Android 6 - Dutch: - Android 6-Smartphone - French: - Android Smartphone 6 - German: - Android 6 Smartphone - Hebrew: - הטלפון החכם אנדרואיד 6 - Hindi: - एंड्रॉयड 6 स्मार्टफोन - Hungarian: - Android 6 okostelefon - Italian: - Smartphone Android 6 - Japanese: - 6 の android スマート フォン - Korean: - 6 안 드 로이드 스마트폰 - Malay: - 6 pintar telefon Android - Norwegian Bokmål: - Android 6 Smartphone - Romanian: - Android 6 Smartphone - Russian: - Смартфон Android 6 - Spanish: - Smartphone Android 6 - Thai: - สมาร์ทโฟน android 6 - Turkish: - 6 Smartphone Android - Vietnamese: - Điện thoại thông minh Android 6.